While hiking, I often carry along a small GPS device to record my tracks. This is not just useful in case I get lost and need to backtrack, but also allows me to geotag my pictures before uploading them. 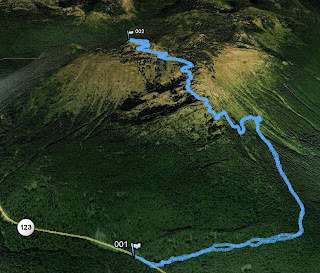 Plus it can be fun to review a hike in Google Earth. What about sharing tracklogs? This can be valuable when hiking in areas with outdated maps or maps hat don’t have all trails. So I had a look at some of the existing websites for sharing GPS tracklogs–here’s what I found. TrailRegistry appears to be one of the oldest sites for sharing tracklogs. It also has the smartest approach, using a network algorithm to consolidate overlapping tracklogs and remove noise. Unfortunately the site doesn’t appear to have had much effort invested into it since it was set up in 2003. GPXchange also appears to have been around since about 2003. The interface is similarly lacking and trail coverage isn’t great. No attempt is made to consolidate tracklogs. GpsXChange.com is a simple forum where people can post tracklogs. Seems to have been around since circa 2006 – like the following sites. Finding a tracklog requires searching the forums e.g. with a trail name. There doesn’t appear to be a huge amount of participation. Redtrails is based on the trail maps compiled by Northwest Trails, where you can submit tracklogs (and wait for them to be integrated into a consolidated trail map database which is released every month or so). This is by far the most comprehensive set of trails (for Washington State) that I came across. EveryTrail is a Web 2.0-ish site where you can share a trip by uploading a tracklog and some pictures. Nice site to browse around, but if you are looking for a specific trail, your chances aren’t to good (unless it happens to be a major tourist attraction). Requires login to download raw tracklogs. Similar to EveryTrail. The interface is a bit less cluttered interface but I found only a dozen hiking trails for all of Washington State. Also requires login to download raw tracklogs. The focus of this site seems to be more on keeping track of your fitness than providing hiking trail maps (e.g. it will show additional information such as the heart rate, if recorded), but it has the best interface for looking at tracklogs. There’s a reasonable amount of trails. Exports raw tracklogs in Garmin’s TCX rather than in the standard GPX format. There is no shortage of options for uploading tracklogs. The ideal site would both store individual tracklogs and aggregate them into consensus trails – while making use of contextual information (How long ago was a tracklog recorded? During what season? Using what device? How reliable is the submitter?). Such as site does not appear to exist at the moment.